12-MINUTE READ · By Supermetrics. Supermetrics proudly presents an integration with AdRoll, one of the largest programmatic advertising networks. You can easily report, analyze and monitor your AdRoll campaigns in Google Sheets and Google Data Studio. Below are a few reasons why the new connector is useful for AdRoll advertisers. Our AdRoll integration covers all the metrics and dimension offered by the Adroll API. With a few clicks, you can get a general overview of how your key metrics are performing on a single page, or build customized reports with metrics and dimensions relevant only to you. The integration allows reporting on all levels. 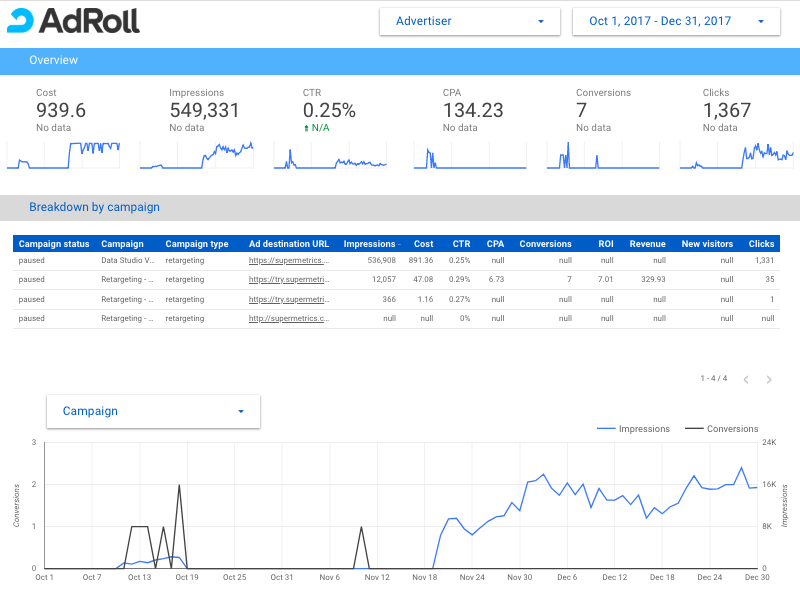 In addition to the Campaign and Ad level reports you can find in the AdRoll UI, you can also filter or report on the Advertiser level. You can make your AdRoll report more informative to your audience with the help of graph, pie chart and table data visualization options in Google Sheets and Google Data Studio. While AdRoll already offers a nice UI, spreadsheets are often the default go-to option for analyzing PPC data and campaign efficiency. And our Google Sheets add-on makes AdRoll data at your fingertips in Sheets. Take advantage of the analytics and visualization options, ranging from filtering to advanced pivot tables. For example, if you want to take a look at how your different landing pages are performing against each other, you could group your campaign data by landing page, by simply choosing Destination URL as a dimension. A lot of times you may want to know which segment, platform or placement resulted is bring you more conversions. To help with this, some of the dimensions are available on the AdGroup level, such as segment, platform, placement and flights. If you work in an agency, you probably have multiple AdRoll advertiser profiles to report on. After pulling the data with the connector you can get an overview how all the profiles are performing or choose a specific advertiser profile to look at. Running ads on a number of other platforms apart from AdRoll? With Supermetrics you can create reports with data from multiple sources. Pull data from programmatic advertising platforms, like DoubleClick and Criteo, or big social networks, such as Facebook Ads, Twitter Ads and others, to pull together a handy report. Or combine AdRoll data together with statistics from Google Analytics to create a neat dashboard. In addition, you can use Google Analytics’ Multi-Channel Funnel Reporting in Data Studio to see how AdRoll performs alongside with other channels. 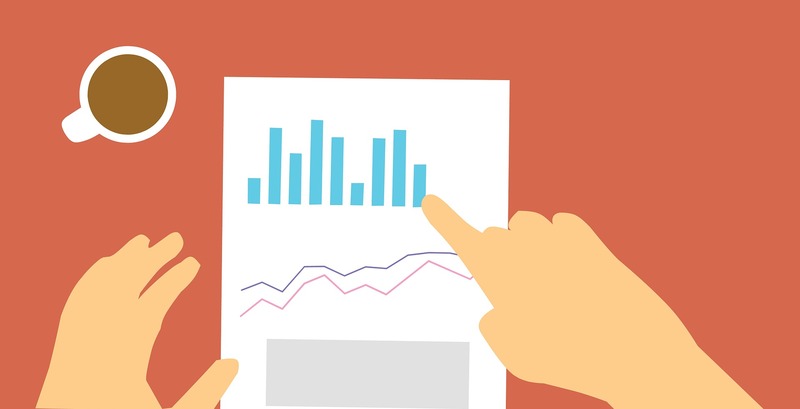 You can also tweak the dashboard according to your specific needs by using these advanced Data Studio tips or add metrics from other data sources to your dashboard. To access the template connect to AdRoll data source and click “Use report template for new reports” in the bottom of the page.